Type-A, Milled Point, carbon steel self tapping screws. Designed for attaching both metal-to-wood and metal-to-metal. 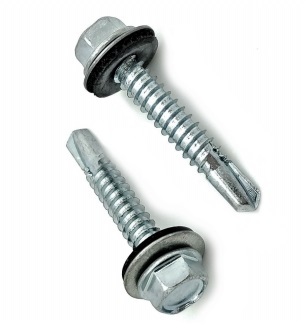 F asteners do not require a pre-drilled hole when attaching 26 and 24 gauge metal to wood. #14 x 2-1/2 in. Screw with 5/16 in. AF Hex Washer Head SMS and Sealing Washer. Type-A, Milled Point. Painted Top. #1295483 / A3597-GBF. 250/Bag. Price/Bag. (Select Color Before Adding to Cart; Shipping leadtime 2-5 business days).